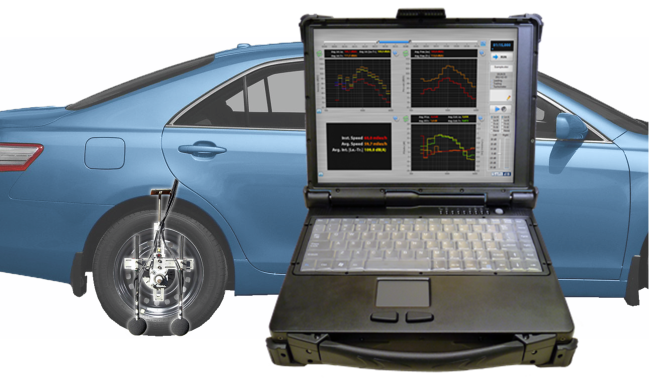 The SoftdB OBSI Software is the first turn-key solution for the measurement of On-Board Sound Intensity (OBSI) Method (AASHTO Designation: TP76-10) This software is used both for real-time acquisition and processing, and post-processing of recorded files. Primarily intended for the Conductor platform, the OBSI software can be used with the Alto6-i USB analyzer connected to a PC. The OBSI method is a technique to measure tire-pavement noise using two phase matched microphones placed in a side-by-side configuration. The microphones are attached to the hub of a wheel using a special fixture with one microphone located in the leading edge of the tire while the other microphone is placed near the trailing edge. This technique uses a reference tire according to ASTM F2493.